India is a land of rich cultural heritage and geographic beauty. There are many places of tourist interests in India and every year many foreign tourists from different parts of the world come to explore the eternal beauty of this Nation. Tourists come for different purposes such as tourism, business, education, family reunions, etc. Foreign nationals planning to visit India for tourism, vacations or business should check the travel advisory bulletins of their respective countries. Before finalising your plans to travel to India it is advisable to check the travel advisory notifications of your country. These travel advisories are posted with specific information regarding the health and safety for prospective travellers. 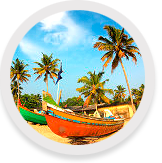 For travel tips to visit India please click here.